Europe is watching on in astonishment as all hell broke loose overnight in the German city of Chemnitz. Police were vastly outnumbered by the rightwing protesters who fought both their leftwing counter-protesters and riot police in clashes all over the east German city. The official statistics say 6 people had to be transported to hospital afterwards but social media shows many more. Thousands of far right protesters clashed with riot police after the killing of a German man by a Syrian and an Iraqi refugee during the weekend. The activists gathered in the centre of Chemnitz for a second day on Monday, shouting "we are louder, we are more" and "lying press". Demonstrators hurled bottles and firecrackers at about 1,000 rival left-wing protesters, who yelled slogans like "Nazis out" and "There's no right to Nazi propaganda". Social media shows videos of beaten down Antifa protesters lying in the street, friends crying around them. The German government had sent hundreds of police officers in riot gear as they were expectant of things getting out of control but even with reinforcements from Dresden and Leipzig the protesters easily outnumbered them. 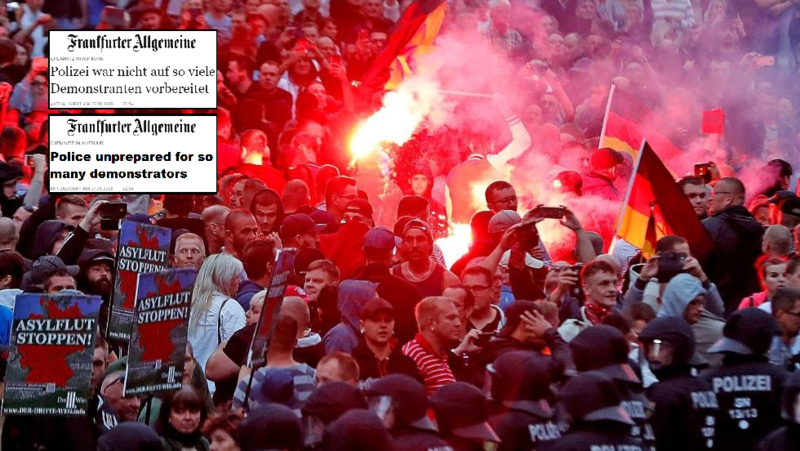 There was criticism that the German media had chosen the word "demo" to describe Sunday's far-right marches and ‘hunts’ on migrants. Related coverage: <a href="http://thegoldwater.com/news/35260-Germany-800-Chemnitz-Protesters-Declare-Open-Hunt-On-Refugees-After-Stabbing-Video">Germany - 800 Chemnitz Protesters Declare ‘Open Hunt’ On Refugees After Stabbing (Video)</a>. Organizations such as the Turkish Community Germany (TGD) claimed they were “clear pogroms”. The police did report two cases of physical assault during the marches on Sunday night, while videos posted on social media showed neo-Nazis attacking people they considered to be of foreign origin in the street. What’s the point of ever taking a vacation abroad? Might as well just look at old pics and read stories cause the culture is all but gone and it’s one shitville after the next. Used to be the mudslimes all lived in their mud huts mad at the world in the shitholes they made, now they are exclusively shipped in wholesale to every majority white country to be mad and take advantage of our kindness. Hopefully it gets out of control and develops into genocide. People can only be pushed so far. The globalists are cocky and think we are ignorant. Hopefully this is the start of good European people standing up for their heritage and culture. Merkel has invited and enabled a rapefest by merciless savages from hell and does not seem to care about the young women of Germany and their plight she has brought on with this wanton debauchery and her view is so self-righteous the compassion part of her brain must be completely numb or even dead. The UK is going the same way, Sweden already has. So now why is it so surprising so many at last grew a backbone and are doing something about their country on the ever steepening slippery slope to hell. Of course there are riots because they have no option, no one listens to the people seriously, just keep sticking their finger up at them… of course, something had to give in the end and unless something is taken seriously and with sincerity, it will get a lot worse yet. It seems more ans more Germans are getting fed up of the religion of peace, tolerance and understanding. As usual, those on the far left defend the fascist ideology of islam. Wake up Germany! You will not be alone in this fight!